There Is No #1 in iTunes Podcasts "New and Noteworthy"
Anyone who tells you about being #1 in iTunes “New and Noteworthy” is wrong. There's no such thing as #1 because “New and Noteworthy” is not a ranking system. Look at “New and Noteworthy” at almost any time and you'll see highly popular podcasts visually below less popular podcasts. You'll also see that ratings and reviews don't matter in that context. At this time, the “#1 New and Noteworthy” podcast (Significant Digits) has only 7 USA ratings, only 2 episodes, and a massive more-than-30-day gap between those 2 episodes. 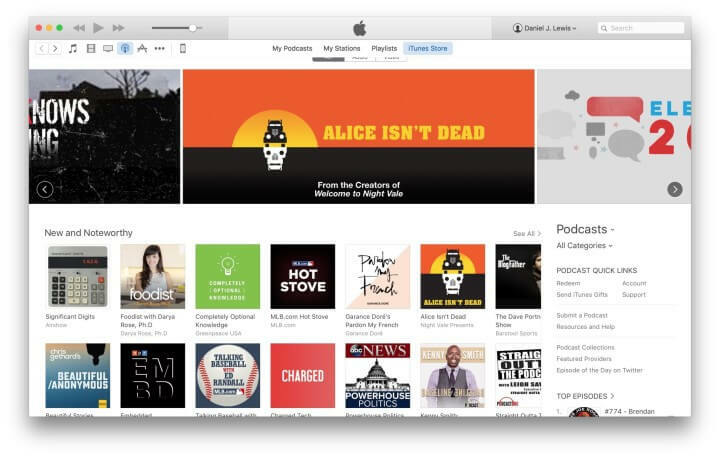 But the “#11” podcast (Alice Isn't Dead) has only 2 episodes, 215 USA ratings, and it's being featured by iTunes in the top big banners in the podcasts front page. If “New and Noteworthy” was a ranking system, Alice Isn't Dead (from Night Vale Presents) would probably be a true #1 or vying for that top position with the other new podcasts from major networks NPR, MLB.com, ABC News, and PodcastOne. There's absolutely nothing about Significant Digits that makes it #1. It breaks nearly every so-called “fact” proclaimed by marketeers. So how did such an “insignificant” podcast (pun intended) get placed so prominently in the “New and Noteworthy” list? Because the iTunes Podcasts team saw something about this new podcast that they considered noteworthy. Please, stop obsessing over bad advice from marketeers who don't know what they're talking about or they're passing on misinformation without validating it themselves. Examine the facts and you'll see other things that contributed to their success (such as great content, presentation, production, and promotion; or influence over a large, loyal following). “New and Noteworthy” is a reward, not a goal. It is not the key to your podcast's success. Market your podcast as if Apple will do nothing for you and you'll get better results. 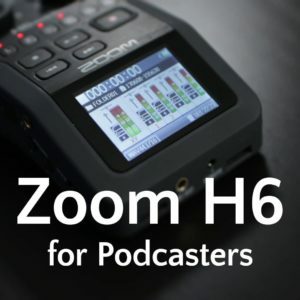 You are the key to your podcast's success. You don't need to wait on anyone else's permission or feature to succeed. Amen Brother Daniel. “Its becoming clear to people that it takes an enormous amount of work to be successful on top of which you actually have to have talent.” – Gary Vaynerchuk For those who have neither a work ethic, morals, or talent, please quit reading this and go back to Twitter bombing, Review Swapping, and obsessing over your stats. Great job Daniel. There is a list of podcasts in the New and Noteworthy section. The list has a top. If your podcast is listed at the top of the list… well you’re #1 right? I don’t understand why you would say (as per the attached message) Significant Digits is anything other than #1 in the New and Noteworthy section. Sure, the New and Noteworthy list doesn’t have numbers like the Top Podcast listing… but that doesn’t mean the list doesn’t have a top. It’s not a “top” because there’s nothing about it that ranks it higher than any of the other podcasts. If there is no ranking, then there’s no such thing as #1. Thus, it’s no special accomplishment or bragging rights, as it indicates nothing about how noteworthy it may be. In the above example Significant Digits is listed above Beautiful Stories. Perhaps there is no specific ranking, but the first show is listed above the other. The second show is listed above the third ranked show and it goes on until you get to the end of the list. The shows that aren’t on the list, aren’t on the list. That matters. If we can get shows listed in one of the top 32 positions then we’re on the front page of the iTunes store. If we can get a show in one of the top 16 positions, we are ‘above the fold’ on the front page of a tab on the iTunes store. So when people click over to podcasts, the show art we create will display to them upon loading of the page. I’m confident that that is a big deal. Topping the list vs. ranking. We’re talking about differences in semantics right? If I’m understanding correctly, more accurate language might be, ‘we were featured in N&N’ or ‘we were selected to appear in N&N’ or something like that. Sure. That’s semantics though. 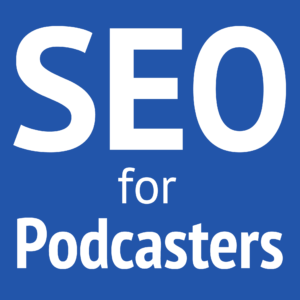 The core issue is that N&N is a goal that podcast producers should seek for their clients. No no no no no. N&N is a reward, not a goal. It’s bad advice to obsess over getting into N&N. It’s not the magic that marketeers make it out to be. Usually, when you see success with someone who was in N&N, you should investigate further and you’ll see their success came from what else they were doing, not the mythical unicorn magic of N&N. We set an intention to get clients in the new and noteworthy section for at least 3 main categories with each launch we do. It’s harder to get on N&N of the main page on the front of the store, but that is something that we often get with clients who have established audiences. You’re right that we can’t promise that. It’s not a promisable thing. Our clients always hit N&N of at least a category or two. We notice a visible drop in download growth after the 8 week period just following launch. We do this on a monthly basis for clients so it’s not some wacky science, it’s just our repeated results. 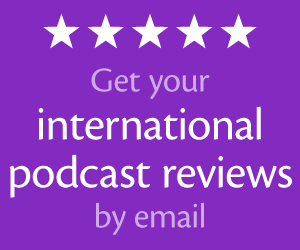 We get these results by working with clients dedicated to creating high-quality podcasts. Perhaps that’s why it’s a repeatable thing, but it’s real. It’s not magic, but being on the front page of iTunes podcasting shows significant perception benefits to the brands and people we work with. We can see the statistical drop off when we are no longer listed in the N&N. This is marketing, because we like to market the success people can have with high quality, strategic podcasting. I think it’s good advice. The only reason I’m being so terse in this comment is that I often say that N&N is a good goal and if someone reads this post after talking to me, they might think I’m not telling the whole truth. Thank you for speaking your opinion, but at Freedom Podcasting we have results that show that not shooting for N&N is a mistake. The #1 way I’ve discovered new podcasts, by far, is hearing about them on other podcasts. #2 is by doing a search on iTunes. #3 is by doing a Google search, finding a website, and noticing they also have a podcast. Hey Steve, agreed on the importance of making your podcast visible in 1-3. I think if you leave any of those out, your leaving audience on the table. I can’t point to specific data points now as our clients stats belong to them so I can’t provide screencasts without doing a big blog post on this. I can tell you without a doubt that N&N still matters. I find podcasts there (most recently Jocko Podcast and The Intern). More importantly, we see significant drop off in download statistics for clients once their time in N&N is complete. Hey Ian, if the numbers went up due to the N&N exposure and stayed, then that would indicate it’s pretty effective. But, if they are dropping back off after a podcast leaves N&N, I have to question what was happening during that N&N time. Maybe more people were checking it out – clicking on it and playing an episode, or part of an episode – but if they don’t actually stick around and subscribe, was it worth it? Maybe, but not a whole lot, IMO, if it isn’t sustained. Again, I can’t speak for the average person, but I don’t spend much time looking at N&N for new podcasts to listen to. I think that’s my main question… when a typical person wants to find a podcast to listen to, how likely are they going to be influenced by N&N? Do they even start there? My hunch, is that I’m actually more typical than I think (even if 50+ podcasts, and learning about podcasting/starting one, isn’t typical at all). I’m betting most people hear about a podcast from a friend, then about other podcasts on those podcasts they start listening to, and via websites that apply to their interests. THEN, they head to iTunes to subscribe, and *maybe* see a new podcast in N&N depending on how laser-focused they are in the subscription process for what they went there for. In other words, I think *we’re* the odd-ducks in actually spending much time looking at N&N in the first place. To answer your question, ‘is it worth the effort to concentrate on N&N?’ I think yes. Do all listeners who find a show on N&N subscribe? Probably not, there is no way to know. My thinking is that topping that list is helpful in building brand awareness. Again, I can’t speak for others, but I typically subscribe to podcasts on my iPod touch/(in the near future, my phone, but same thing) by searching for the podcast I’m wanting to subscribe to, and then subscribing. From that vantage point, there is no N&N to pay attention to. I’ve pretty much only visited podcasts via iTunes to check out N&N for discussions like this, or to see how (I used to think) a particular podcast was ranking. (Which if Daniel is right, and it doesn’t identify rank, was kind of pointless). Exposure is exposure, I guess. So, to the extent that a podcast is good enough to hold onto someone who checks it out, being in N&N can’t hurt. As you noted, it seemed to increase exposure. But, what percent stayed? I guess the real question is whether one should put effort (and/or how much) into trying to appear there. I used to hear about various strategies around initial podcast release and social media drives to try and boost it in and such. I guess now I’m of the opinion that I’d just launch (probably with a couple of episodes, just for a more solid appearance) and not worry much about N&N. If/when I’d show up, it would just be a nice *potential* bonus. Yes, N&N gives some exposure that might not have otherwise been there. But it is not the key to podcasting success. In fact, focus the same efforts elsewhere and you’ll see better growth that stays. Since this conversation began a week ago we’ve launched another client’s show. Our initial schedule wasn’t fast or aggressive enough to hit the N&N. We adjusted our launch strategy to publish more aggressively and request more reviews from the clients following. Our adjustment made up the difference (whatever that may be). He hit the N&N list. After he hit the list, we see a clear jump in download statistics of about 200%. Of course, focusing on making an excellent show with excellent show art is the base of any podcast launch strategy. When the show comes out, N&N is a great way to track success and getting to the top of that list is helpful if your goal is to have more show downloads. It’s an early sprint in the marathon that is building a podcast audience, but if you’re going to run a race, you might as well run to win, right? I’ve commented on this publicly, most recently at Podfest 2016 in Tampa. I agree with you Daniel. Placement of podcasts by Apple within New & Noteworthy is anything but a ranking. I strongly discourage my clients from attaching a ranking to it. What gets me as much as anything, is when I see podcasters who not only tout a ranking, but don’t even get the order right. For example, it wouldn’t be at all unusual – using your image – for the Completely Optional Knowledge podcast to declare they’re #3 in N&N when, if they were to click the “See All” button, they’d realize they’re actually 5th in the order. The Foodist is actually 3rd on the list as the order alternates between the top and bottom rows. So, not only are new podcasters assigning a ranking where they shouldn’t, they’re often assigning the wrong one. Tout N&N if you want and get excited. I don’t have a problem with it. Just don’t give it a number.